The ext endpoints of the Synthetic API enable you to push external synthetic data to Dynatrace. Push external synthetic data to Dynatrace with the POST external tests to Dynatrace call. 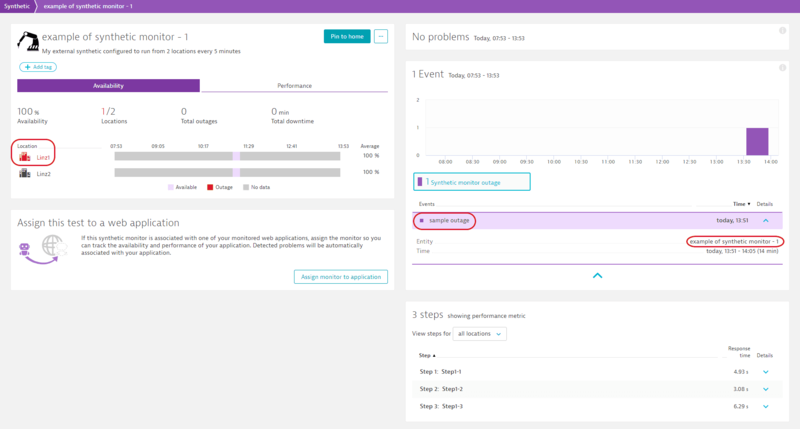 Push external synthetic events to Dynatrace with the POST external events to Dynatrace call. Modify states of external monitors with the POST modify state of external monitor call. Manage synthetic monitors—see the Synthetic API page for details. Retrieve information about synthetic locations—see the Synthetic locations API page for details. Retrieve information about ActiveGates which are able to execute synthetic monitors—see the Synthetic nodes API page for details. Pushes external synthetic monitors, locations, and monitor execution results to Dynatrace. To execute this request, you need the Create and configure Synthetic monitors permission assigned to your API token. See the Authentication page to learn how to obtain and use it. The JSON body of the request, containing external synthetic monitors, locations, and results. The type of the external synthetic monitor. The URL of the external synthetic monitor icon. The timestamp of the message creation, in UTC milliseconds. The list of external synthetic locations. The list of external synthetic monitors. The list of results of external synthetic monitor execution. The results of external synthetic monitor execution. The ID of the external synthetic monitor. Number of steps in the monitor. Results of external monitor executions per location. The ID of the location. The timestamp of text execution start, in UTC milliseconds. The step is successful (true) or failed (false) - will influence availability timeseries. The overall response time of the monitor from this location, in milliseconds. If absent, it is calculated as the sum of response times of all steps. Results of individual monitor steps. The overall availability of the monitor from this location, percent. If absent, calculated as the number of successful steps compared to the overall number of steps. The result of the individual step of a synthetic monitor. ID of the step. It is unique within the test definition. The timestamp of text step execution, UTC milliseconds. The response time of the step, in milliseconds. Absent when no meaningful response time is available (as may be the case for certain error conditions such as a misconfigured step script). The error message of the step. The error message of a synthetic monitor step. The name of the monitor. A description of the monitor. The information on monitor setup, for example browser. The timestamp of the monitor expiration, in UTC milliseconds. The URL to the results of monitor execution. The URL to edit the monitor in the original UI. The monitor is enabled (true) or disabled (false). Default is true. If true, set the deleted parameter to false. The flag of the deleted monitor. Default is false. If true, set the enabled parameter to false. Locations from which the synthetic monitor runs. Steps of the external monitor. The timeout of the monitor, in seconds. If no result is reported within this time, the availability state switches to unmonitored. Default is doubled frequency of the monitor. The frequency of the monitor, in seconds. The monitor is repeated with the specified interval at the external source. Dynatrace expects results of a monitor execution with the specified interval. If you report results to Dynatrace less often, adjust the noDataTimeout value accordingly. The step of a synthetic monitor. The ID of the step. The name of the step, displayed in the UI. The location is enabled/disabled. Default is true, enabling the location. The name of the location, displayed in the UI. The IP address of the location. Three locations: Linz1, Linz2, and Linz3. Two monitors: example of synthetic monitor - 1 and example of synthetic monitor - 2, each containing three steps and running from two locations. One result per step, per location, for each monitor. Since the request body is lengthy, it is truncated in this example Curl section. See the full body in the Request body section. You can download the request body JSON to perform a sample request in your environment. Be sure to replace the time stamps with recent ones or the results will be too old. Highlight shows parameters, submitted in the request. To update an existing external monitor, specify its engine in the syntheticEngineName field of the ExternalSyntheticTests object and its ID in the id field of the ExternalSyntheticTest object. You have to submit all the parameters of the monitor. Do not change the values of parameters you don&apos;t want to change. Pushes information about external synthetic events to Dynatrace. The JSON body of the request, containing external synthetic events. The list of external synthetic events. The list of open external synthetic events. The list of closed external synthetic events. The closed external synthetic event. The ID of the Synthetic test. The unique ID of the event. The end timestamp of the event, in UTC milliseconds. The open external synthetic event. The list of IDs of external synthetic locations where the event happens. The start timestamp of the event, in UTC milliseconds. In this example, the request adds the outage event to the example of synthetic monitor - 1 external synthetic monitor from the POST external monitors to Dynatrace example. You can download the request body JSON to perform a sample request in your environment. Be sure to replace the time stamps with recent ones or the results will be too old. The highlights show parameters submitted in the request. Modifies the operation state of all external monitors. The JSON body of the request, containing new operational status of external synthetic monitors. The new operation state for all external Synthetic monitors. In this example, the request sets the state of external monitors to active.